Next Day ADA Signs you create today! What makes Next Day ADA signs different? 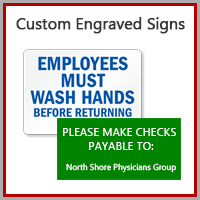 You create your own next day ADA signs same day for next-day or overnight delivery. Our unique sign designer application will assist you in your sign design. See it as you create it! As the designer you choose from a variety of sizes, material, colors, textures, corners, backing, and quantities. 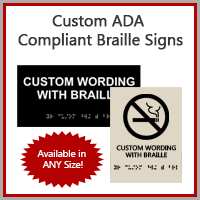 We also offer Common ADA signage for quick ordering. 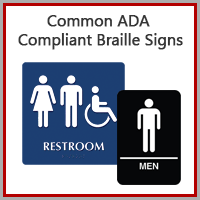 Common ADA signage can even be personalized to your specific needs. The designer even uses the most current Grade 2 Braille ADA sign requirements.